"Fresh vegetables and a rich variety of seasonings make this a great springtime or summer dish for a party or a family picnic. I used this recipe to feed over 100 people and it went over fabulously. It also makes a fabulous side dish." Cook spaghetti in a large pot with boiling salted water. Rinse with cool water, drain. Place grated Parmesan cheese, sesame and poppy seeds, seasoning salt, paprika, garlic powder, black pepper, cayenne pepper, chopped cucumber, onion, red and yellow pepper, tomatoes, and broccoli in a large bowl. To large bowl add cooled pasta. Pour entire bottle of Italian dressing over pasta and vegetables. Mix well. Refrigerate pasta salad for at least 2 hours. Serve. I've notice this and it sounds delicious, I just wanted to add that instead of spaghetti...it would be interesting to use linguine and maybe even add Salad Supreme...it's flavorful. This is excellent and a nice change from "regular" pasta salad. Made it for my coworkers and was asked for the recipe many times. Will definitely make again. This was a really great recipe. I did not use spaghetti, I used Cavatappi pasta instead, as I think long noodles and oil dressing is a recipe for a stained shirt! i love pasta and i love veggies. throw anything in this from your garden and let it marry a couple hours or more and grab a fork! Wonderful! 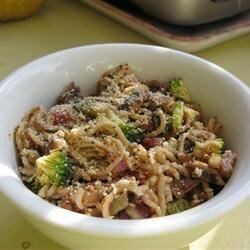 My husband hates broccoli normally but loves italian dressing -- but this dish even had him wanting seconds. I loved this dish. There's not much to it, which is a positive for me. I used whole wheat pasta, organic italian dressing, and tons of veggies. I feel so healthy and it's so tasty too.